APRILscans 004, originally uploaded by lone_goomba. "Terminator tries to find an alternate time-machine. However, this being 1984, he doesn't know that Doc Brown would ultimately settle on a DeLorean, and not a refrigerator, in 1985." 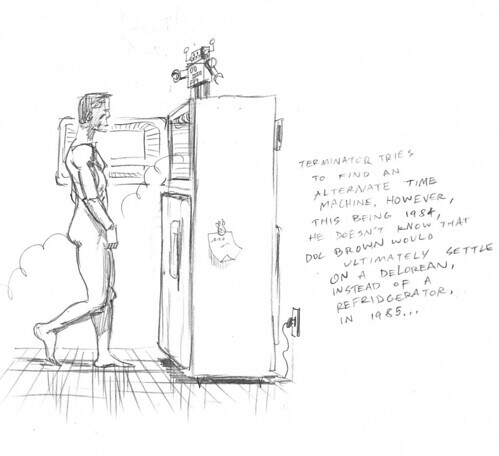 the producers of Back to the Future actually did consider using a refrigerator as Marty McFly's paradox-mobile. Eventually someone must have told them "If you're going to build a time-machine, why not do it with some STYLE"
As for the dates, Terminator came out in 84' followed by Back to the Future in 85'.